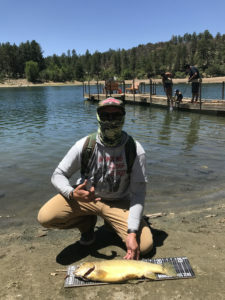 David Worsham wasn’t at Prescott’s Goldwater Lake on Saturday, June 2 for the family fishing event or even the stocked rainbow trout. He was there to catch big bass. Yet the Avondale, Ariz. resident left with a potential state and world record Gila trout. Worsham caught a 23-inch, 5.12-pound Gila trout that is in the process of certification as an Arizona state record. This unique fish species is one of two native trout species to Arizona. Worsham said he kept the fish. He caught the behemoth Gila on a lipless crankbait. The rest of his rig consisted of a Megabass Levante Diablo Spec-R rod, a Daiwa Tatula 100 baitcasting reel and 15-pound fluorocarbon line. He said he was fishing one of Goldwater’s coves for big bass when he noticed a lunker cruising from deep water to the shallows and back. He switched from a swimbait to the lipless crankbait and hooked the Gila. 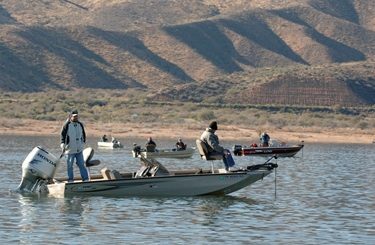 The previous inland waters, hook-and-line Arizona state record Gila trout was 3 pounds, 5.6 ounces and 19 1/4 inches caught by Roberts Woods of Flagstaff from Frye Mesa Reservoir in 2011. Gila trout are found only in Arizona and New Mexico. The New Mexico state record Gila trout is 4 pounds, 8 ounces. The International Game Fish Association All-Tackle World Record Gila trout stands at 3 pounds, 7 ounces and was caught by Bo Nelson in 2011 from Arizona’s Frye Mesa Reservoir. Of course, Worsham’s fish is heavier than both. His catch has not yet been certified by the IGFA. Ironically, Worsham’s record fish came from brood stock in New Mexico’s Mora National Fish Hatchery. 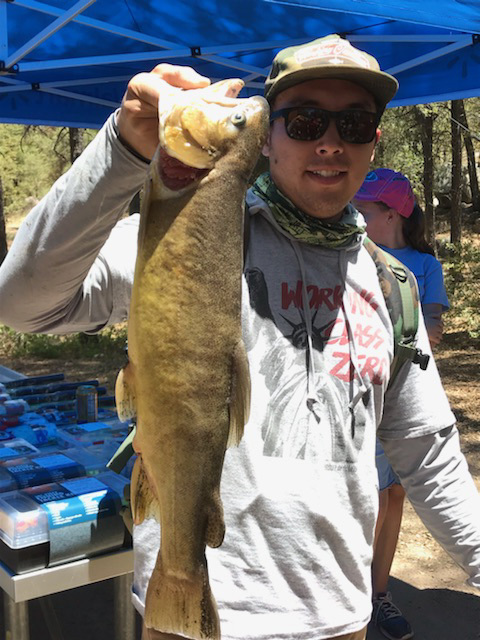 AZGFD believes the fish likely came from a 2016 batch of 2- to 3-pound stocked Gila trout. AZGFD is stocking more Gila trout this month into Goldwater Lake and the West Fork of Oak Creek.